Ecospike is a metal strip with spikes attached that is designed to fit on precast walls but will fix to solid walls just as easily, it is made from a metal which is perfect for the South African climate (especially coastal areas) and is supplied in lengths of around 1.5 metres. As some precast wall slabs vary in size we usually make Eco-Spike to measure. 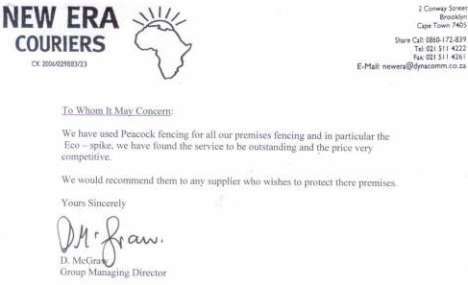 Peacock Fencing offer an installation service, for which we are happy to quote for. The minimum Eco-Spike installation charge is currently R500.00 for up to 15 metres or 10 lengths of Eco-Spike, whichever is the smallest and R40.00 per length thereafter. Peacock Fencing also offer a precast wall heightening service, subject to an on site inspection and quotation to increase the height of your precast wall by one, two, or three slabs. Peacock Fencing supply clear plastic bird spikes that are UV stabilised and come in 1 metre lengths with breaking points aproximately every 50 mm ensuring that they can be fitted nearly anywhere. Current pricing (2008) is R45.00 per metre. The Bird Spike is a D.I.Y. product and easy to install with Silicon, String, Cable Ties, can be screwed down or glued on to a multitude of surfaces. Peacock Fencing supply pallisade fencing, gates and gate motors (The installation of these products is done by approved sub contractors). Come see us and say "Hi" at the Milnerton Flea Market, Marine Drive, Paarden Eiland on Saturdays from 8:00 am until 2:00 pm or on Sundays from 8:00 am until 3:00pm. Weather Permitting. Peacock Fencing are able to service Cape Town and the Western Cape as far as Boland in the North and Hermanus in the East. Ecospike supplied and installed for as little as R70 per metre subject to minimum purchase 10 metres and of installation premises being within 30kms of Cape Town city limits. Phone Martin now on 084 509 8895.